Shri Naina Devi Ji Trust have invited application for Junior office assistant and driver posts in District bilaspur of Himachal Pradesh. Naina Devi trust is recruiting junior office assistant in Information technology with one seat reserved for person with disability. Detail about name of post, age, education qualification, fee and how to submit application of Junior office assistant in Naina Devi Ji Trust is given below. Classification : Class -III (Non - Gazetted). Classification : Class - III (Non - Gazetted). Age for the direct recruitment is between 18-45 years. Relaxation in age will be give. To those who are already working in public sector in autonomous body or semi government departments. * 12th from recognized organization. * One year diploma in Computer science/computer application/IT from recognized organization. * 10 +2 with 'O' and 'A' level certificate from NIELIT. * Computer typing speed sane as given above. * Candidate should have knowledge of customs, manner and dialects of Himachal Pradesh. * Candidate should be 10th pass from recognized institution. * Must posses valid DL(Driving License) of Heavy / Light vehicle in hill terrain. - SC/ST/OBC - ₹ 250. Fee should be in favour of Temple trust of Naina devi ji through e-payment only. Fee recieved once will not be refunded. 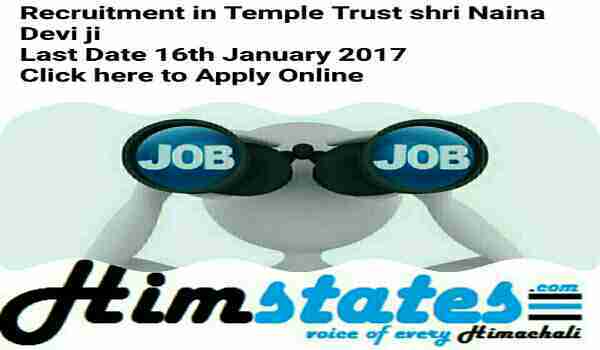 * Candidates those who want to apply for the posts should read instructions carefully available on temple trust website. Read instructions carefully and fill form online. * Candidates must ensure age,qualifications, category etc as mentioned on oficial website. * Incomplete online form without application fee, photograph, scanned signature etc. will be rejected. * No TA/DA will be admissible for the interview. * Fee once submitted will not be refunded. Last date to apply for reciept of application form is 16th January 2017.